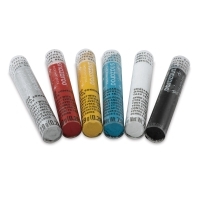 This professional-quality make-up has a high pigment content to ensure vivid colors. 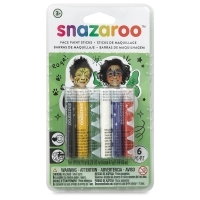 Snazaroo Face Paints are water based for easy application, and for removal with soap and water. 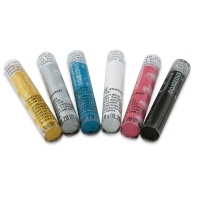 These paints dry fast, enabling you to paint multi-color designs quickly and easily. 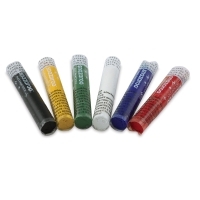 Unisex, Set of 6 Sticks — A great, basic face painting palette, this set of six paint sticks contains Black, Blue, Green, Red, White, and Yellow. Boys, Set of 6 Sticks — Create lots of super cool characters with this set of six paint sticks, which includes Black, Blue, Red, Silver, White and Yellow. 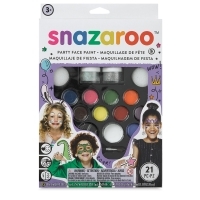 Ultimate Party Pack — Filled with vivid, best-selling Snazaroo colors, glitter gels, application tools, and a step-by-step guide, the Ultimate Party Pack includes enough paint to decorate up to 65 faces. The pack includes 2 ml pans of White and Black, 1 ml pans of Bright Red, Bright Yellow, Dark Brown, Grass Green, Orange, Pale Pink, Royal Blue, Sky Blue, Sparkle Lilac and Sparkle Pink. It also includes Silver and Star Dust Glitter Gels (8 ml each), three brushes, and four sponges. Boys Palette Kit — From soldiers to tigers to superheroes, this kit lets you create a wide range of fun faces every boy will love. 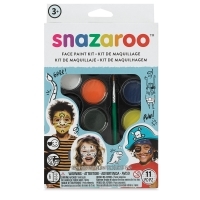 It contains 2 ml face paint pans in Black, Blue, Brown, Dark Green, Orange, Red, White and Yellow plus a sponge, a brush, and a 16-page face painting guide. Girls, Set of 6 Sticks — Girl power! 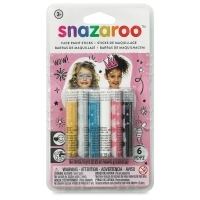 Angels, butterflies, and fairies are just a few of the whimsical characters you can create with this set of six paint sticks in Black, Gold, Pink, Silver, Turquoise, and White. 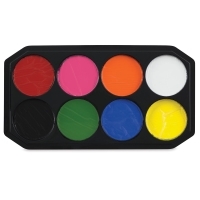 Jumbo Palette, Set of 8 — Paint more faces with this jumbo palette. A great range of classic colors in a larger 18 ml size, this set includes Black, Bright Pink, Bright Red, Bright Yellow, Grass Green, Orange, Sky Blue, and White. 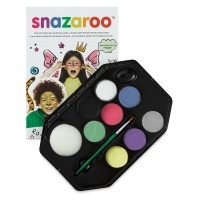 Unisex Palette Kit — Snazaroo's best-selling basic kit is ideal for beginners and for general use. The Unisex Palette includes 2 ml pans of White, Black, Bright Red, Sky Blue, Bright Yellow, Grass Green, Purple, and Bright Pink. It also includes a brush, a sponge, and a 16-page, full-color face painting guide. Paints 50 full faces. 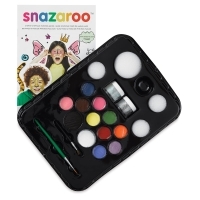 Girls Palette Kit — The Princess Painting Kit contains 2 ml each of White, Pastel Yellow, Fuschia Pink, Turquoise, Pastel Green, Metallic Silver, Sparkle Blue, and Sparkle Lilac face paint. Also includes a brush, sponge, and a 27 page step-by-step face painting guide. Shipping Note — Due to manufacturer distribution restrictions, Snazaroo products cannot be shipped to addresses outside of North America. 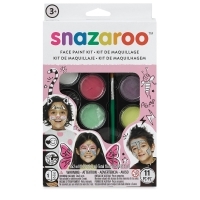 This video demonstrates how to apply Snazaroo Facepaints for a witch inspired costume. This video demonstrates how to apply Snazaroo Facepaints for a devil inspired costume. 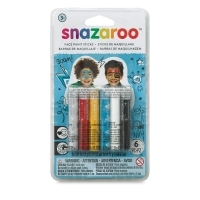 This video demonstrates how to apply Snazaroo Facepaints for a vampire inspired costume.